For some Hardy Plant Society members, the lectures, annual meeting, plant sales and other activities of general membership are not enough; they want to get together with other local gardeners more frequently and in a more intimate way. To meet this need, members of HPSO have formed some smaller study or interest groups. Interest Groups come in two basic types: groups based on geographic proximity and groups based on the study of a specific topic or area of gardening. 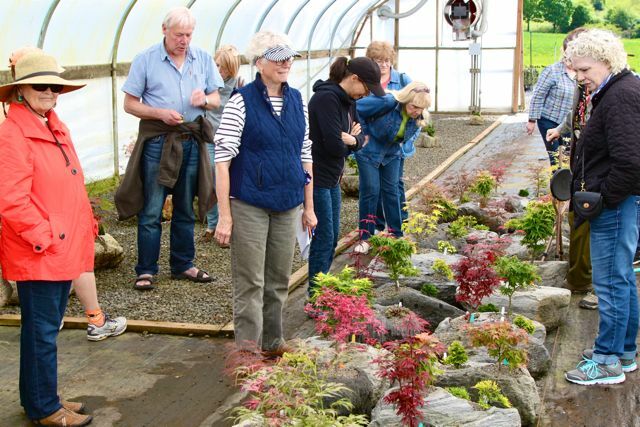 The groups based on geographic proximity tour gardens, have lectures of interest to the members, visit local nurseries and other members gardens. Although geographically based, these groups are not limited to membership only from gardeners in their areas. Since 1994, the HPSO-Clark County Interest Group has been sharing gardens, ideas, plants and friendships. Most or our 80+ members live in Clark County, WA plus a few from Cowlitz County. Our meetings are held on the second Wednesday of each month, March through October and we are open to new members. 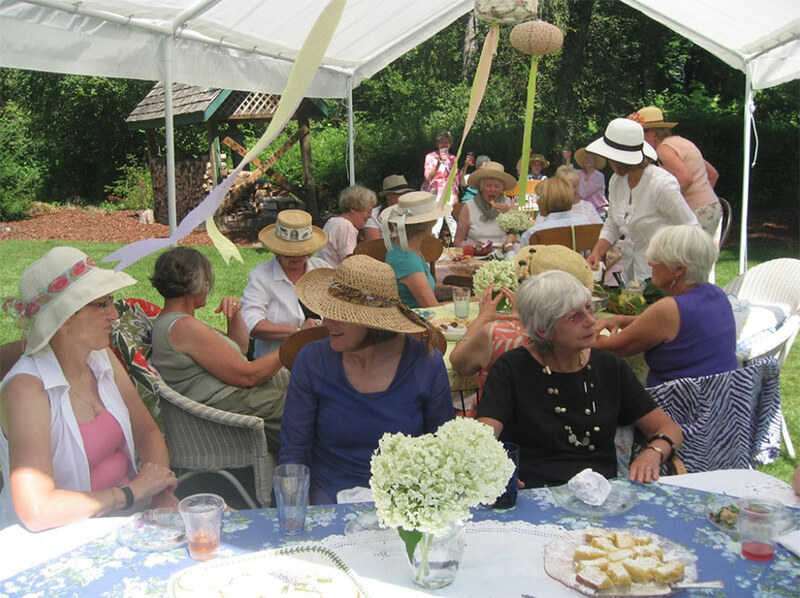 Meetings are normally held at a member’s garden and include a garden tour, potluck dinner, short business meeting and a presentation about various gardening topics by a guest speaker. Our focus is on education whether it be a formal presentation, timely articles in our monthly newsletter or simply gardener to fellow gardener. We maintain the Grant House Gardens on Officers Row in Vancouver in cooperation with the Fort Vancouver Historical Trust. We also plan occasional field trips to area nurseries, encourage our members’ participation in HPSO events. Connecting gardeners who often form lifelong friendships is perhaps the best perk of membership in HPSO-CC. The Columbia Gorge Interest Group is looking for gardeners interested in meeting other local gardeners. Join us for tips on gardening in the Gorge, ideas on plant selection, book, blog, and magazine suggestions, and much, much more. This group meets in members homes throughout the year. Meetings are held on the first Thursday of each month in the morning. This group meets in members homes throughout the year. Meetings are held on the second Wednesday of the month in the evening. This group meets in member’s homes throughout the year. Meetings are held on the third Thursday of the month in the afternoon. In addition there are 2 yearly plant exchanges, nursery trips and a holiday pot luck. The Two Rivers Group was founded in 2006, by Hazel Childs. Our focus is education and social togetherness. We are a diverse but very simpatico group of women, having a wide range of garden styles and horticultural interests. We love to share, listen and learn from each other. 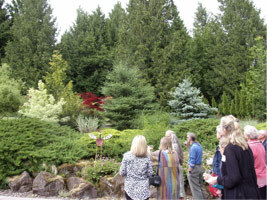 The group enjoys planned visits to local public and private gardens, including member gardens. We also love to visit nurseries and other horticulture businesses and sometimes we host speakers. We ALWAYS include lunch! All of our members live in the areas near the Willamette and Tualatin Rivers including Lake Oswego, West Linn, Oregon City, Tualatin, Wilsonville and Woodburn. We stay in touch by group emails and we meet on the second Thursday of the month. We are approximately 32 members strong, which is the maximum size that makes this group work. For practical and logistical reasons, we are currently not adding members. 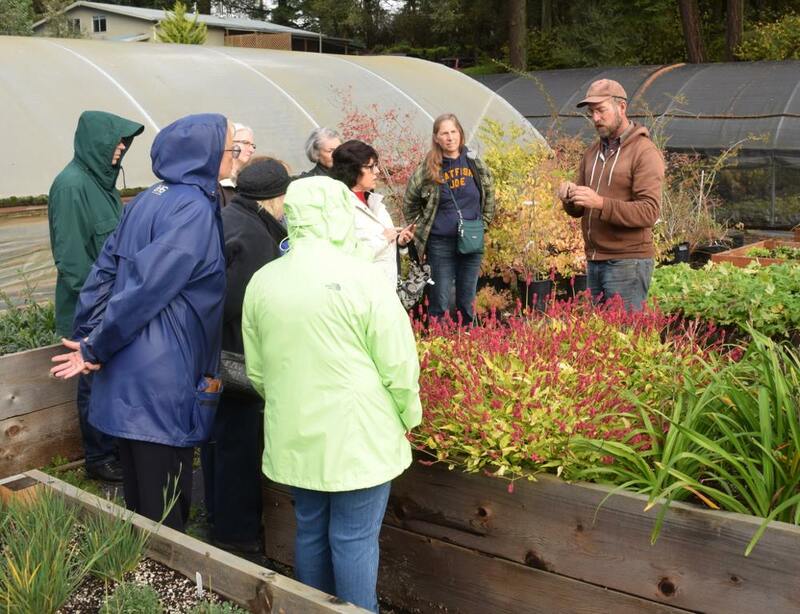 The Westside Study group furthers garden related learning by offering visits to area nurseries and gardens (public and private) as a small group. 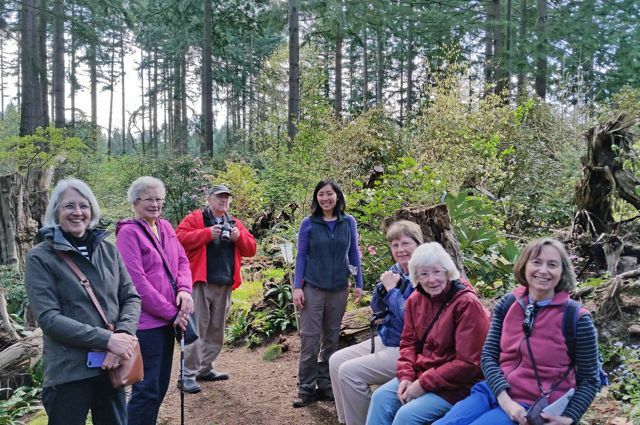 The smaller group helps foster personal friendships with other members who share a passion for plants and gardens. It also provides a great, informal forum to exchange ideas, problem solve and generally share our latest successes or challenges. Our group is a good choice for anyone who wants to expand their involvement beyond the main HPSO sponsored activities. We meet on the third Thursday of the month in the mornings. In the winter we might have a speaker, slide show or other indoor activity. The spring and summer months have garden and nursery visits. We have a summer soiree with spouses, an autumn plant exchange and we have in the past done some summer overnight trips and a holiday luncheon. Occasionally we will have an all-day activity. Our dues are $10/year. Membership in HPSO is required. Most of our members come from the Westside of Portland, but we welcome anyone who is an HPSO member to join us. Our activities are mostly in and around the greater Portland metro area, but are not limited to that area. This group melds gardeners and needlework enthusiasts. The group meets both in member’s homes and at various needlework-related stores around the area. Meetings are held the second Tuesday of the month in the late morning. Members in this group are active gardeners 60 years old on up. They provide a supportive network to edit and simplify their gardens, visit nurseries, gardens and take field trips. They meet on the third Tuesday of each month in members homes in the early afternoon, or sometimes earlier for field trips. Hi there HPSO Walkers! The HPSO Walkers walk every fourth Thursday of the month. We go three or four miles each time. We go around the Portland Metro area and sample local parks and neighborhoods. The monthly notification gives location to meet and conditions we expect to encounter. At the first walk you will see if there is anyone you can carpool with in the future. We try to leave very promptly at 9:30am. Any member of HPSO is welcome to join us once or as often as they like. Well-behaved dogs on a leash are welcome on the walk. We always have great conversation about our gardens as well as the flora we encounter! This is a social group rather than a get in your target heart range group. We usually go for coffee after the walk. Who doesn't like free plants? A lot of people think you need advanced learning or special gifts to be a good propagator, or that you need expensive equipment. None of these things are true. While some plants are trickier to propagate than others, and fancy equipment may make the job more efficient, in general you can get excellent results using good old-fashioned common sense methods and simple tools. These are what we explore in Seedy Characters. Our group meets once a month to share information, swap seeds and cuttings, and go on field trips. Plant propagation enthusiasts of all skill levels are invited. Contact Amy Campion at [email protected] for more information. We meet approximately the 3rd Saturday of each month at 2pm around the Metro area. We currently have just 3-4 members, so we’ve developed real friendships. Our group is more than one year old and we are really hoping we can find other west side members. Our crafts are portable and have expanded over time. They include knitting, beading, crocheting, drawing, painting and more! We meet in each other’s homes or local coffee shops most often, but have also ventured out of our area to check out unique gardening places. We are considering trying a gardening craft at a future get together. We’ve all been gardening for many years, but our own gardens are at different stages and have distinct styles. We share plants from our gardens and stories from our lives, including gardening successes and failures. Please join us as we explore our crafts, talk gardens, and enjoy coffee or visiting homes and getting to know each other for this relaxing, fun weekend special interest group. This group meets 3-4 times a year at the HPSO office for travel slideshows and socializing. Meetings are usually Sunday afternoons during Fall/Winter/Spring and a Thursday afternoon if we have a summer meeting. There are no dues, however we do accept donations to cover program expenses. HPSO Travel Club members receive early notices and early registration for upcoming HPSO overseas tours. For more information about these groups or for help getting your own group started, please contact us. If you are already a member of HPSO and would like the contact information for the group chair, please see our Members-Only Study & Interest Group page for details.